We’re well into the time of year when, in Minneapolis, the air outdoors will freeze your nose hairs on the first breath, and snow has lost its charm. Here in Vancouver, the only substantial snow is on the mountains across the water, but there’s ice on the trails in Stanley Park, and the trees are lacy with frozen fog. In either city, it’s the time of year for soup: elaborately spiced pho, classic chicken-noodle, and chili. 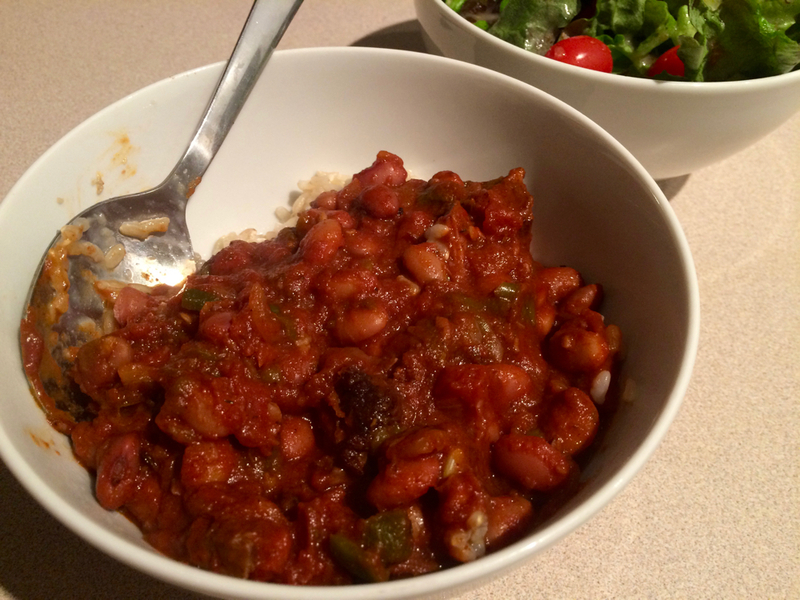 I don’t so much have a recipe for chili as I have some rules of thumb. My preferred ratios of ingredients, and some of my spicing, are informed by the recipe in Mark Bittman’s magisterial How to Cook Everything, but really that one confirmed a lot of what I’d already arrived at through trial and error. This probably won’t win you a state-fair cook-off, but it’ll make a big pot of hot, hearty, fragrantly spiced chili of the sort that goes perfectly with some cornbread or over rice on a cold winter night.